PLN9 Security Services: What is the need of training the trainers? Training the trainers is important as it helps them impart their respective trainings more efficiently and effectively. It actually gives them an opportunity to work on their skills and core competencies and come out with something more exciting, innovative and unique, eventually benefitting the end – users. Trust me; not every training can create the same impact. There are trainings where people sitting on the last bench are either yawning or fiddling with their cell phones. Do you think such trainings solve any purpose? Absolutely NO. They are nothing but a mere waste of time and energy. It is essential for us to understand the purpose of training programs. Trainers, first and foremost, need to be trained on how to deliver an exciting session where each one irrespective of the time duration listens with rapt attention. Every trainer has more or less the same content but what actually makes the difference is the style of delivering the same. Trainers need to be trained to be confident so that they create an everlasting impression on the audience. 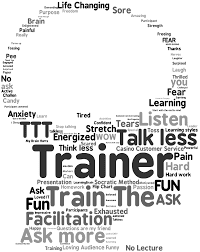 Very few trainers lay emphasis on their overall behaviour and how they conduct themselves. The role of a trainer is just not to read out slides but actually motivate the audience to incorporate the learnings in their day to day life. Trainers need to be patient and their personalities need to speak for themselves. It is essential to train the trainers on what they should wear during trainings and what should be avoided. Dressing plays an important role in creating the desired impact. Trainers, under no circumstances should reach late for sessions.